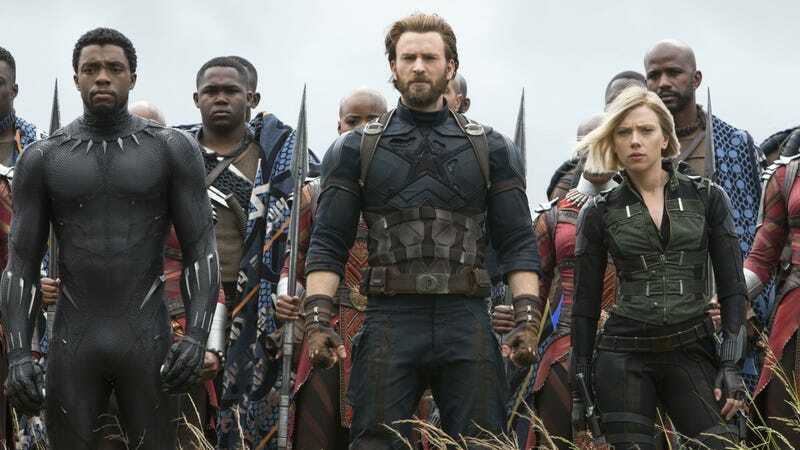 Captain America (Chris Evans) and Black Widow (Scarlett Johansson) retreat to Wakanda with Black Panther (Chadwick Boseman) in Avengers: Infinity War. When audiences meet Captain America and Black Widow again in Avengers: Infinity War, they’ve changed. It’s not just that Cap has a beard, or that Widow has ditched her iconic red hair for blonde locks—it’s that since the Avengers disassembled they’ve been running their own covert missions, and it’s taken a toll on them, both physically and mentally. And now they’re about to face their greatest challenge by far. In June 2017, Johansson’s Widow and Chris Evans’ Captain America could be found arriving in Wakanda—a.k.a. the Atlanta set of Infinity War—with several other Marvel heroes, hoping to enlist T’Challa’s help (you can read more about the scene itself here.) However, though Rhodie (Don Cheadle), Bruce Banner (Mark Ruffalo), Falcon (Anthony Mackie), Scarlet Witch (Elizabeth Olsen), and Vision (Paul Bettany) are with Cap and Widow, Evans is quick to point out these are not the Avengers, and things are not like they’ve been in the past. Those circumstances, of course, revolve around the arrival of Thanos (Josh Brolin), the mad titan who attacks Earth to seize the Infinity Stones. 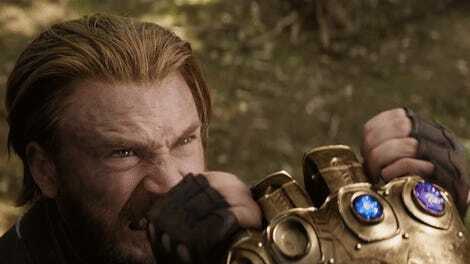 As the new trailer reveals, if he procures all six, he’ll be able to murder half of the universe instantly—and many of the stones are in the possession of various Avengers, including one that powers Doctor Strange’s Eye of Agamotto amulet, and another located in the head of the android the Vision. Evans felt Captain America and the other superheroes have been anticipating for some time. Thanos’ invasion is an epic story all on its own, but Infinity War is also trying to continue telling the story of the individual Avengers’ story and bring all of the Marvel Cinematic Universe’s heroes together. Johansson admitted Infinity War is very plot-heavy. The Russo brothers direct Johansson on the set of Infinity War. Those “feelings” she refers to includes the dangling romantic subplot between Black Widow and Bruce Banner (last seen in Avengers: Age of Ultron and referenced most recently in Thor: Ragnarok), as well as Cap and Widow’s ongoing conflict with Tony Stark (Robert Downey Jr.) since Civil War. Evans and Johansson said all of that will be addressed, but it just can’t be at the forefront. Speaking of burying things, Evans and Johansson could say almost nothing about the plot of Infinity War, to the point where they repeatedly joked about how little they could tell us. But they would say how excited they were to bring these stories, which include over a dozen Marvel movies between them, to a conclusion. We’ll find out how when the movie premieres on April 27.